The Alba Madonna (c.1510) by Raphael is one of the brightest jewels in the NGA’s crown and it’s also a work that plays a special part in the gallery’s history. Bought in the 1930s from the Hermitage in Russia by Andrew W. Mellon, it formed part of the core collection that helped establish the museum. Mellon, a successful businessman and later public servant and diplomat from Pittsburg, Pennsylvania, founded the NGA by creating its first building on the Mall, filling it with his own art and dedicating the lot to the nation. In 1941 President Franklin D. Roosevelt accepted the NGA on behalf of the American people and an institution was born. I’m looking at Raphael’s painting today for two reasons: since the word alba means dawn in Italian, I’ve chosen this work to represent two new beginnings: the birth of the National Gallery of Art and the start of Art 2010. I want to write about the experience I had when I first saw this painting, which proved to me the importance of seeing art in person, where possible. You see, I thought I knew this painting. I’d studied it, looked at it in reproductions and even written about it in my university finals. But it was only when I actually came face to face with the Alba Madonna that I really started to ‘get’ the painting and see things I hadn’t seen in it before. There’s a little cross held between the Virgin and the babies Christ and John the Baptist and it’s the way the figures relate to this cross that stings. At the moment of Christ’s birth, Mary was assured of his fate. Imagine that, knowing of the death of your child from the moment of its birth, knowing you’re going to outlive that child, knowing for sure he’ll suffer. This is the tragic foreknowledge that flits across the Virgin’s face. You can detect it in the babies too, quietening for a moment as they gaze upwards. It’s this searing feeling that I hadn’t expected, that hit me most on my first ever visit to the NGA. 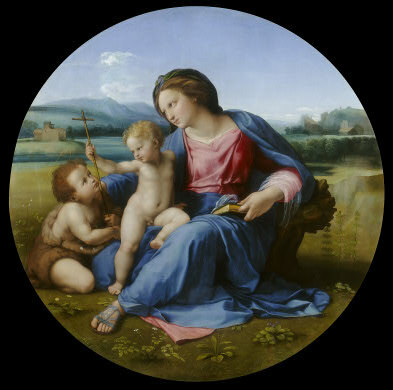 By focussing on this emotion, Raphael brings other aspects of the work into relief: thus he subtly undermines the tranquility of the blue-green landscape, thus the plump pink bodies of the babies are exposed and made vulnerable. Even the superfine brushstrokes on the downy wisps of Christ’s hair and the fur of John’s camelhair clothing become unbearably poignant. Raphael was born in 1483 and together with Leonardo da Vinci and Michelangelo, he defined the High Renaissance, a period that ran from the late 1480s to the 1520s. Raphael was the youngest of the three, and is often referred to as a synthesizer, using the advances made by his two great contemporaries. So here for example Raphael emulates the geometric pyramidal composition pioneered by Leonardo as well as his delicate shading and style of landscape. From Michelangelo he takes the physicality of his figures and their purposeful gestures. But that’s where the similarities end, where Raphael’s absorption stops and where his innovation starts. When I was about 14 and learning about art for the first time, a teacher told me something that has stayed with me. He said that the triumvirate of High Renaissance masters could be linked to the different parts of man. According to him, Leonardo’s work represents man’s mind and intellect, as shown in the artist’s scientific experiments and his technical approach to painting. Michelangelo, a sculptor by preference and hence connected to his work in a physical way, comes to stand for the body, its force and its will. It is then left to Raphael to complete the picture: after the head and the body comes the heart, or soul. This is what Raphael brought to High Renaissance painting, something new and entirely his own: canvases filled with human emotion. As one of the very first works in the NGA collection, I feel this painting embodies something of the soul of the institution, the essence of Andrew Mellon’s original aim to make art accessible to many people. And for me today, what a great place to start Art 2010, my personal exploration of this massive body of works. hi — so glad to have found your blog! i’m showing this one to my ap art history students today. we live in virginia & just returned from an art-filled weekend in NYC. students got to witness marina abramovic’s “the artist is present” LIVE at MoMA. unforgettable! looking forward to more works & conversation on this site.